At Roadway Construction Service (RCS), there are no barriers to traffic management solutions. We go all out to offer traffic control services unsurpassed for safety, reliability, and efficiency. What does it take to reach this level? Experience, skill, training, dedication, vehicles, equipment, and top-flight gear all play a part. Yes, barriers have no place in our total traffic management approach, except on the road itself. We’re referring, of course, to traffic safety barricades. One of the most common of these is k-rail. RCS offers both types – concrete or water-filled plastic, each providing rock-solid protection for a wide range of roadway construction scenarios. Plastic or concrete, these barriers maximize project efficiency by preventing access to restricted areas, re-directing vehicular traffic, and protecting pedestrians and crews. K-rail installation is not exactly a cake walk. In fact, the process requires the advanced skills of a well-trained crew, skills capable of meeting a variety of challenges. Like the one thrown our way by Holland Construction. Located on busy La Brea Blvd. in Los Angeles, their bi-level parking structure project demanded a monster solution. And RCS pulled one out its vaults — an 8,000 pound-per-20-foot k-rail designed to protect a massive flow of vehicular and pedestrian traffic, as well as work crews. Often, k-rail alone isn’t enough to cover all the barrier bases. 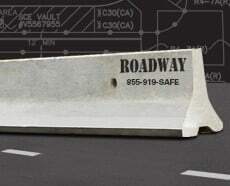 For that reason, RCS amplifies its total traffic management approach with a wide range of barricade options. Among the solutions we offer are arrow boards, night and day cones, surface mount delineators, and A-frame barricades. Strategically deployed, each of these solutions furthers the protective powers of k-rail. How does RCS know which barricade (s) to deploy? That, and all other traffic management questions, are resolved during the crucial planning stage. In our hands, no stone is left unturned. Everything from warning signs to equipment to crew size is taken into account, digested, and re-formulated into a workable strategy. To maximize accuracy, RCS traffic control plans are site-specific. This means planners provide drawn-to-scale designs as well as reports on current conditions, all efforts supported by cutting-edge technologies. The result is a consist output of air-tight traffic control plans unequalled for safety and efficiency. Closely related to traffic planning is traffic permitting – the process of obtaining proper authorizations from government officials and other key decision makers. Familiar with the permitting process top to bottom, RCS skillfully navigates the municipal territory, gaining quick, efficient responses to crucial permitting questions. Thanks to this efficiency, clients save substantial sums that might otherwise be spent on long, drawn-out permitting battles. If you’d like to learn more about barricade deployment, planning, permitting, or any other traffic control service, contact RCS for answers to all your questions. You’ll soon discover why we set the standard for total traffic management in Orange County, L.A., and all of Southern California.